Some attitudes are clearly inconsiderate, some behaviors clearly inflammatory. But some — eating a certain sandwich, humming a certain tune — aren't as obvious, and can easily become part of a horrifyingly annoying work routine if you aren't made aware of them. 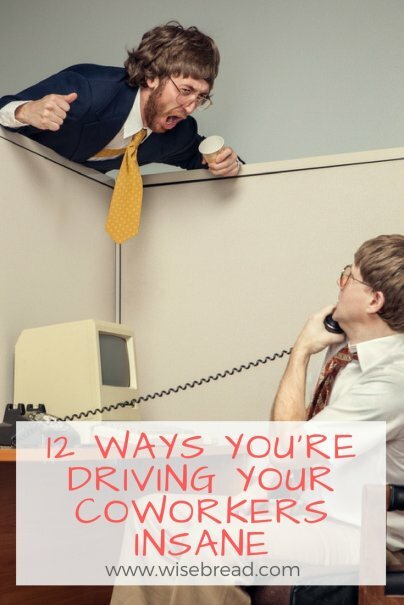 So check out this list of behaviors guaranteed to provoke your colleagues. You're sure to recognize most of them… just hopefully not in yourself. Imagine a drum solo from Led Zeppelin's John Bonham, arguably the greatest percussionist of all time. Now imagine that solo repeated twice. Three times. All day. 9-5. For the length of a career. Now imagine that the performer is not, in fact, the world's greatest drummer, but is instead a co-worker bouncing a pen on his desk as a snare. Now agree that this is hell, and make 100% sure you are not this person. That carnitas burrito may smell great to the person about to eat it at his desk, but to everyone else, it's torture. Distracting, hunger pain-inducing torture. If you insist on eating a hot lunch that's even mildly pungent, better to do so in the break room, or better yet, outside the office. Sniffling, sneezing, and feverishly sweating at your desk aren't signs of workplace devotion to your coworkers, who are the ones standing to be hurt if they catch whatever you've brought in. Beyond being wrong, taking credit for someone else's work isn't even a good strategy to get ahead. Any favor you gain from others will eventually be eroded by the ire you've raised from whoever's idea you claimed. Less obviously, insisting on credit for your own ideas can also be irritating to coworkers. What's important is the value of the idea, not its source, and any focus on where it came from means you're thinking politics, not results. If you've got an open office plan, you know the torture of hearing a co-worker drone on to their wife, husband, mom, friend. And frankly, it's not just personal calls that can irritate: Even business-related calls can be inappropriately distracting if they last too long. If the call's necessary, make sure you're speaking quietly into the receiver (the person on the other end will get it — you're at work), and stepping out for calls that you know in advance will go long. Popping into a vacant meeting room is often a good solution. You know how some calls in the office just have to be taken? Well no calls in the bathroom have to be taken. It can make others uncomfortable and create backup for people waiting to get in. Not to mention the gross out factor should the person on the other line hear a flush (…or worse). Any organization can benefit from critical thinking, and there's value in questioning whether certain ideas will work. But frankly, poking holes in others' plans is easy. What's hard is coming up with a better idea, and you'd do well to be armed with one before naysaying someone else's proposal. And when you do have to squash someone else's idea, try to do so as diplomatically (and privately) as possible. There are any number of things that can be horribly misinterpreted in emails (yes, even ones with emoticons). But a frequent source of scorn with inter-office emails are phrases — shorthand, even — that seem dismissive. What can feel like an innocent, efficient way to save time to the sender can be a virtual slap in the face to the receiver, especially if you haven't yet developed an email rapport. That means play it safe: no sarcasm, nothing that could be wrongly interpreted, at least until you're comfortable with each other's inboxes. As long as you're within the dress code, being casual is fine. But mustard stains, and worse, their accompanying smells, are not casual. They're slovenly. Even if it seems uptight to you, some people just have difficulty focusing in an environment that's disorganized and messy, and that extends to you and your desk. Think of it like your neighbors complaining about the house with the jungle-like front yard and ancient paint job. It may be your environment, but everybody else has to look at it. Being late is never ok, but it's at least somewhat understandable when driving is involved, which at least allows for the possibility of unforeseeable traffic (though really, you were probably just late). It's very hard to claim traffic problems on the route from your desk to meeting room #1, though. Here's a simple calculation to help understand how annoying chronic meeting lateness: multiple the minutes you are late by the people in the meeting, and the aggregate is what we'll call your Inconsiderate Quotient. Remember how much everyone hated that kid in school that reminded the teacher about homework when class was being dismissed? Same sentiment. Some sort of wrap-up period at the end of meetings is normal, and often vital to making sure the ideas discussed become actionable projects. But once the meeting is actually adjourned… let it go! If there's something pressing that you forgot to say or ask, email that specific person privately — there's no need to keep everyone else after hours. Possibly the one thing worse than taking a phone call in the bathroom. What other office behaviors that drive you absolutely crazy? Please share in comments! Taking care of hygiene at your desk (popping zits, clipping tie nails, and loudly and pride soy blowing your nose). Ugh.